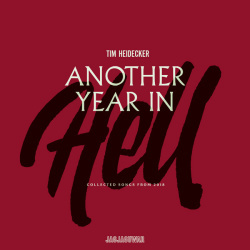 Today, Tim Heidecker releases the Another Year In Hell: Collected Songs from 2018 EP via Jagjaguwar, the follow up to 2016’s acclaimed Too Dumb For Suicide: Tim Heidecker’s Trump Songs. He also shares a lyric video for “Ballad of ICE Agent Ray,” edited by Vic Berger and stylized with a still of Trump’s twitter and his comically characteristic misspellings. Featuring six songs that are caustic renderings of MAGA characters, both imagined and real, Another Year In Hell boasts the same signature piano and guitar lines from Heidecker’s previous release, but with a sharper bite. While Too Dumb For Suicide made us question when we should stop laughing at our current administration’s incompetence, this release reckons with the disasters that occur at the intersection of stupidity and cruelty. Heidecker marries the absurd to everyday horrors, building a distinctly contemporary hellscape throughout. Two years into the administration, we should know what we’re laughing at. This entry was posted on Tuesday, January 29th, 2019	at 12:17 am	and is filed under News	. Responses are currently closed, but you can trackback from your own site.